Outdoor wooden furniture is the choice of many. It looks good, you have many styles to choose from, and it is durable. Wood has a natural warmth that you can't get from any other material. It coordinates naturally with any garden setting. Some types of wood will only improve after time out in the weather. Wood is a sustainable, renewable material that looks great and fits in most budgets. Some woods are more commonly used than others for outdoor wooden furniture. This may be because they are more sustainable, less expensive to produce, or because they hold up to the weather. This wood is very common. It is a dense hardwood, but it is porous. Because of this, moisture seeps into the wood easily, making it more likely to rot without proper treatment. The wood will blacken as it weathers. While oak contains tannic acid that will protect it temporarily from insects and fungi, it does eventually wear down. Finishing the furniture with a sealant will improve durability; without it, it may only last a year. This popular wood smells great. The oils in the wood are thought to repel insects. While it is not as durable as hardwoods like teak, it does last quite a while. Watch out for knots, as they can weaken the wood. Cedar furniture will last 8 to 10 years with care. This wood was often used to build ships, so you know it will withstand wet weather. Teak, however, is an endangered wood. Most teak on the market today comes from carefully managed plantations, which has increased the costs. Teak contains a high concentration of natural oils that protect the wood from insects and rot. Watch for quality. The heartwood gives the best quality for furniture; it is strong and contains most of the oils. Sapwood is lighter in color and is low in the protective oils. Teak weathers to a lovely silver color and will not splinter. With proper maintenance, teak furniture can last more than 80 years. Outdoor wooden furniture is more than just wood. You need to look at the quality of design. Unless the outdoor furniture you are considering was handmade by a master craftsman, you're better off getting furniture that was made with machines than hand tools. The precision and accuracy of the joints are important to the longevity of your furniture. Hardware should be made of brass, stainless steel or be reinforced with wooden dowels and glue that is weather resistant. The wood should have been kiln dried before being used to make the furniture. This prevents even drying to prevent cracking and warping. Cheaper furniture may not have gone through this crucial step. If the sales staff cannot tell you for sure about the kiln drying and the joinery used for the furniture, chances are these things were not important to the manufacture of the furniture and you may be in for disappointment down the road. Look carefully at the thickness of the wood, the number of slats used on chairs, the joints of the furniture, folding mechanisms and comfort of the furniture. Test any moving parts to see that they function smoothly and properly. 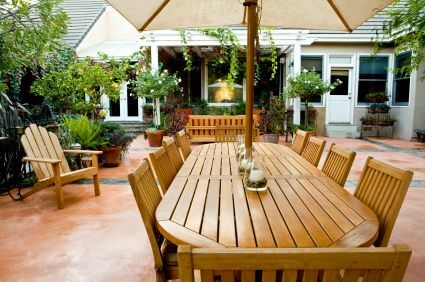 Once you've chosen your outdoor wooden furniture, you will need to care for it properly. Luckily, good wood furniture is fairly easy to care for. Clean teak wood with a soft nylon brush and simple soap and water. Wood cleaner and sealer can help you clean up your furniture and preserve its fresh, natural color if you prefer it. Oil based sealers need to be applied every year to preserve the color of the wood. Before applying it, make sure the wood is completely dry. If not, the moisture will be trapped inside the wood, causing black spots of mildew to appear. Teak does not require oiling unless you want it to remain brown rather than turning silver with age. While you may be tempted to use a pressure washer on your outdoor wooden furniture, don't do it. It may open the grain, which can jeopardize the wood's integrity and cause a coarse feeling to the surface. Some woods do better if you move them to a covered area during the wet season. A covered patio may work, or you may want to find room in the garage. As you can see, quality wooden furniture requires very little maintenance on your part to remain sturdy and beautiful. It pays to make the right choice in the beginning. If you buy a cheap set of outdoor furniture, you'll find that you need to replace it after only a year or two. Make the right decision and get the quality right off the bat. You won't regret spending the money when you are still enjoying beautiful furniture many years down the road.